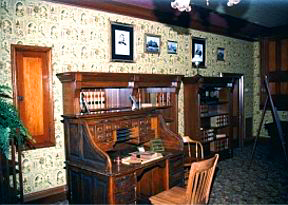 All papers and carpets are based on an early photograph of McKinley's study taken during his official residence which featured a scenic multicolored asymmetrical design on the walls with coordinated ceiling papers. These highly patterned papers were considered suitable for a gentleman's study or smoking room and expressed America's fascination with foreign locales. The carpet was loomed in England in the Victorian manner and is an authentic historic pattern that very closely represents the carpet in the original photograph. Alhambran wallfill. American, 1880's. Document from the Anthenaeum of Philadelphia; originally machine printed. Dot Border. English, 1870; Designed by Owen Jones. Period coloring. Enrichment: American 1880 - 1890. 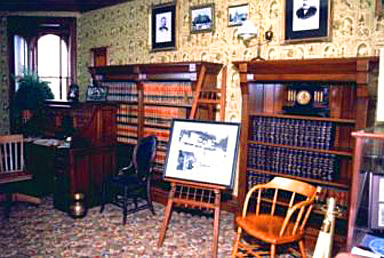 Document from Harvey Firestone House, Ohio. 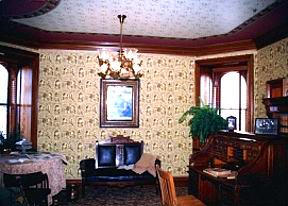 Ceiling Fill: American 1890. Document from Frederick Billings House, Woodstock, Vermont. Originally machine printed. 18" wide.